When exchanging data from your own extensions with PHP scripts, one of the most important issues is the creation of variables. This section shows you how to deal with the variable types that PHP supports. The macro MAKE_STD_ZVAL allocates a new zval container using ALLOC_ZVAL and initializes it using INIT_ZVAL. As implemented in Zend at the time of this writing, initializing means setting the reference count to 1 and clearing the is_ref flag, but this process could be extended later - this is why it's a good idea to keep using MAKE_STD_ZVAL instead of only using ALLOC_ZVAL. If you want to optimize for speed (and you don't have to explicitly initialize the zval container here), you can use ALLOC_ZVAL, but this isn't recommended because it doesn't ensure data integrity. ZEND_SET_SYMBOL takes care of introducing the new variable to Zend's symbol table. This macro checks whether the value already exists in the symbol table and converts the new symbol to a reference if so (with automatic deallocation of the old zval container). This is the preferred method if speed is not a crucial issue and you'd like to keep memory usage low. Note that ZEND_SET_SYMBOL makes use of the Zend executor globals via the macro EG. By specifying EG(active_symbol_table), you get access to the currently active symbol table, dealing with the active, local scope. 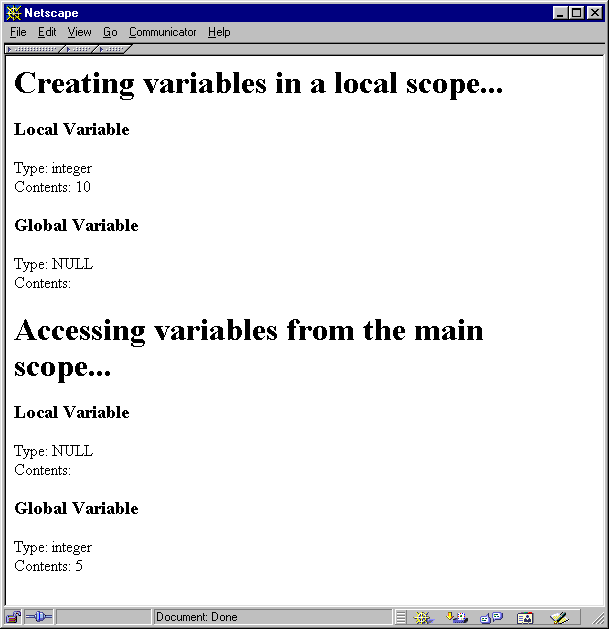 The local scope may differ depending on whether the function was invoked from within a function. This is actually the standard method used in most modules. The macro ZEND_SET_SYMBOL is now being called with a reference to the main, global symbol table by referring EG(symbol_table). Note: The active_symbol_table variable is a pointer, but symbol_table is not. This is why you have to use EG(active_symbol_table) and &EG(symbol_table) as parameters to ZEND_SET_SYMBOL - it requires a pointer. 例子 33-1 shows a sample source that creates two variables - local_variable with a local scope and global_variable with a global scope (see Figure 9.7). The full example can be found on the CD-ROM. Note: You can see that the global variable is actually not accessible from within the function. This is because it's not imported into the local scope using global $global_variable; in the PHP source. 例子 33-1. Creating variables with different scopes.